Stasi and Heistand both add another FSGA Players of the Year honor to their resume after standout 2018 seasons. TAMPA, Fla. – Meghan Stasi and Mary Jane Hiestand were named the 2018 Florida State Golf Association Women's Players of the Year. Stasi was awarded the Amateur Player of the Year honor, while Hiestand was tabbed the Senior Player of the Year. The two players have combined to win 17 FSGA Players of the Year honors over their careers. Both will be honored at the Annual Dinner on November 16. Meghan Stasi was named the Women’s Amateur Player of the Year for eighth time in her career, the most awards won by a female. For the third-straight year, Stasi was crowned the Women’s Amateur Player of the Year. She continued her great amateur success this year with three USGA Championship appearances and seven top-10 finishes. The Oakland Park native began her season with a tied for eighth finish at the Harder Hall Invitational before winning the Ione Jones/Doherty Championship. She took fourth place at the Women’s International Four-Ball at The Wanderers Club, with her partner Catalina Lara. Shortly after Stasi partnered with Tama Caldabaugh to finish tied for fifth at the Women’s Four-Ball Championship at LPGA International. Stasi made three USGA Championship appearances and seven top-10 finishes. The Oakland Park native began her season with a tied for eighth finish at the Harder Hall Invitational before winning the Ione Jones/Doherty Championship. Stasi entered the 2018 Women’s Mid-Amateur Championship at Sugar Mill Country Club as the back-to-back defending champion. Despite a first round eight-over 80, she rallied to shoot a one-over 73 to secure a fourth-place finish. 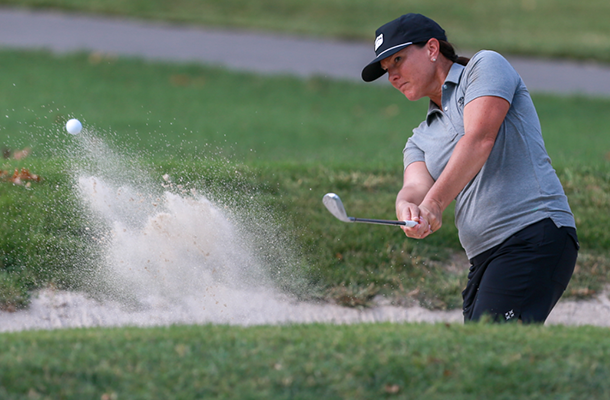 She and her partner Dawn Woodard advanced to the Round of 16 at this year’s U.S. Women’s Amateur Four-Ball, falling to Katherine Gravel-Coursol and Paige Nelson, in 21 holes, at El Caballero Country Club. The eight-time FSGA Player of the Year secured her fifth top-10 finish of the season at the Women’s Amateur Stroke Play Championship at Ritz-Carlton Golf Club, where she finished ninth. After qualifying for the event at Hobe Sound Golf Club, Stasi was one of just seven mid-amateurs in the field at the U.S. Women’s Amateur. She found success again at the 2018 U.S. Women’s Mid-Amateur Championship in St. Louis, Missouri. Stasi advanced to match play for the 13th straight year and was a quarterfinalist. She lost to Defending Champion, Kelsey Chugg, 3 and 2. Stasi closed out the season with a victory at the Mixed Shoot-Out with partner Kevin Hammer at World Golf Village in October. A two-time winner this year, Hiestand was named the Senior Amateur Player of the Year for the second year in a row and the seventh time in the last nine years. Hiestand advanced to the Round of 16 at the Ione Jones/Doherty Senior Championship to begin her 2018 season. She kicked off her FSGA Championship schedule with a tied for fifth finish at the Women’s International Four-Ball with partner Judith Kyrinis. A month later, she posted another top-10 finish at the Women’s Four-Ball Championship with Marie Arnoux. The Naples native captured her fourth Women’s Senior Amateur Championship in April, posting a four-over 148 at Country Club of Ocala. She finished five strokes ahead of runner-up Lisa Schlesinger. Hiestand garnered another top-five finish at the Women’s Mid-Amateur, finishing third. In August, Hiestand won her first Florida Senior Women’s Open Championship. The championship was decided by a sudden-death play-off between Hiestand, Kim Keyer-Scott and Susan Bond. Hiestand and Keyer-Scott both pared the 14th hole to advance in the play-off. Hiestand would come out on top with a birdie on the fourth play-off hole.